(2 mm diameter) with a Canon PowerShot A650 digital camera fitted with a Helios 44M-5 SLR macro lens, using natural light and a dark wool-fabric backdrop. See Brian J. Ford’s Critical Focus: The Hidden Secrets of Snowflakes, page 171. (Photo courtesy of Alexey Kljatov). Excerpt: If the key to playing good music is steady practice, then the key to good microscopy has to be ongoing education. I hesitate in this context to use the word ‘training’ to describe how we teach and learn. As I have been reminded by one of our columnists, this word originates from the Latin trahere, meaning to ‘pull, draw’ and the Anglo-French trainer, ‘to draw, drag.’ Although educators pride themselves in being good teachers and boast of students who are good learners, we don’t usually prefer to have to pull or drag our students, or be pulled or dragged by our teachers, but that’s how it can feel sometimes. Abstract: The art of lifting human fingerprints and their utility in forensic science is well established. The potential of linking the chemical deposition of the fingerprint with prior topical environmental contact has not yet been fully realized. Infrared microspectroscopy (IR) with a 10 × 10 Âµm aperture enables obtaining chemical data from a single fingerprint ridge. The prevalent use of skin treatment via health and beauty products, if detected, may reveal the nature of the unintended deposition. We chose skin treatment contact to illustrate this feature because each particular pharmaceutical company has its own formulation that may leave a distinctive infrared chemical fingerprint. An infrared spectral library of more than 50 different commercial products was established using transmission reflection from a polished stainless plate or an infrared-reflecting glass microscope slide. Transfer of the product to the finger was completed from a thin-coated surface. The fingerprint ridge deposited on a clean, hard surface was subjected to IR to obtain the spectrum to reveal the chemical identity of the residue transferred from the finger. Initial classification of the library spectra was by the prevalence of the carrier solvent type from prominent stretching vibrations, and their individuality was recognized by the pattern of the infrared fingerprint region. Discriminant analysis algorithms were employed to enable objective matching of the spectrum obtained from the actual fingerprint with a particular cosmetic or healthcare product. This modest effort is intended to demonstrate the potential of the infrared micro-spectroscopic forensic approach. Spectra are presented to illustrate the utility of infrared microspectroscopic fingerprinting of fingerprints. Abstract: In 1896, Julius Rheinberg introduced a color contrast method to the microscopy world. This method uses colored discs relatively near the back focal planes of the objective, or more commonly, near the aperture focal plane of the condenser to provide a colored specimen on a colored background. Almost any microscope can be modified to generate this style of imaging, which can be accomplished using a few practical options. The Rheinberg technique is a modification of the darkfield (or darkground) method of illumination and the color contrast enhances the visibility of specimens and their texture. 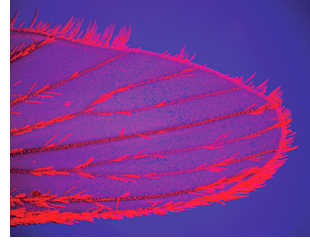 It also provides an esthetically pleasing view of specimens worthy of photomicrography awards. 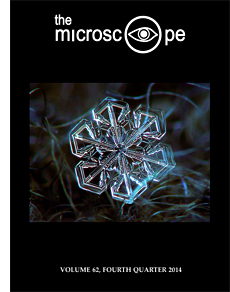 Excerpt: Snowflakes have an intrinsic beauty and have been studied for over 450 years, yet many of the pioneer researchers of snow crystals are unknown to modern science. ‘¦ Johannes Kepler speculated: ‘There must be a cause why snow has the shape of a six-cornered starlet. It cannot be chance. Why always six? The cause is not to be found in the material, for fluids are formless and flow, but in an agent.’ His ‘agent’ was the physical nature of matter — how small atomic elements of water packed together to make ice.